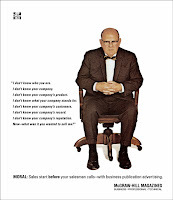 Marketing Insights (now): What was it You Wanted to Sell Me? Now — what was it you wanted to sell me? Translated today - if people do not know your company/product, the "build it and they will come" marketing approach will not generate revenue....so, how are you using a multi-channel strategy to gain visibility/positioning with your clients/targets? The Business Marketing Association created a great video that demonstrates how this ad is relevant in today's modern, tech savvy world. It reinforces the importance of the basics of positioning. Take a few minutes to view - times may change, but the fundamentals of marketing remain. Here's to branding and messaging!